For the last month or so I've been listening to a podcast called You Must Remember This which chronicles the "The secret and/or forgotten history of Hollywood's first century." More specifically I've just completed last fall's series about MGM that gave fifteen episodes worth of stories about the heyday of the most famous studio that more or less created the studio system the golden age of Hollywood is known for. Throughout those episodes there were plenty of insights I wasn't previously aware of and of course facets of the industry that were beyond fascinating, but I bring this up only because it informs how excited I am about the latest film from auteur Woody Allen. Led by the appealing pairing of Jesse Eisenberg and Kristen Stewart Café Society follows a young man who arrives in Hollywood during the 1930's with the hope of working in the film industry. Upon arrival, he falls in love and finds himself swept up in the society that defined the spirit of the age. More than anything else about this trailer it is the visual vibrancy that stands out. Allen's films tend to always have a certain small or confined feel to them as if the director is constantly creating within his own, small world, but there is some actual scope to this trailer with the luscious costume design and cinematography only adding to the sense of time and place. I wasn't a huge fan of last years Irrational Man, but I enjoyed Magic in the Moonlight well enough with its period setting and of course Midnight in Paris is one of Allen's best works in his distinguished career and with this looking very much in line with those if not exactly exploring the same ideas I can't wait to see what the full film holds. 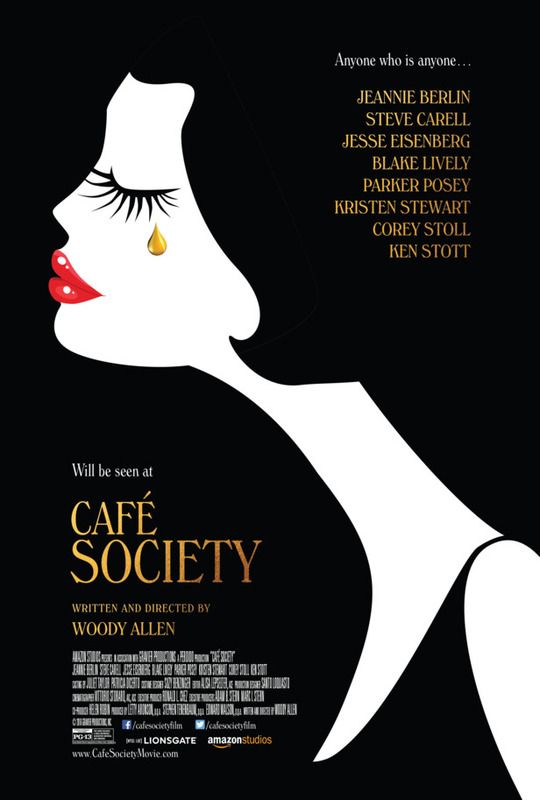 Café Society also stars Corey Stoll, Steve Carell, Parker Posey, Jeannie Berlin, Blake Lively, Ken Scott, and is set to open the 69th Annual Cannes Film Festival.